The chickpea or chick pea (Cicer arietinum) is an annual legume of the family Fabaceae, subfamily Faboideae. Its different types are variously known as gram or Bengal gram, garbanzo or garbanzo bean, and Egyptian pea. Chickpea seeds are high in protein. It is one of the earliest cultivated legumes and 7500-year-old remains have been found in the Middle East. Chickpea is a key ingredient in hummus and chana masala, and it can be ground into flour to make falafel. It is also used in salads, soups and stews, curry and other meal products like channa. The chickpea is important in Indian and Middle Eastern cuisine, and in 2016, India produced 64% of the world's total chickpeas. The name "chickpea" traces from 13th century French chiche and cicer, the Latin term for "chickpea". The term chich-pease, used in the 1500s, derived from chich, the Old French term for chick-pea. The word garbanzo, from an alteration of Old Spanish arvanço, came first to English as garvance in the 17th century, being gradually anglicized to calavance, though it came to refer to a variety of other beans (cf. calavance). The current form garbanzo comes directly from modern Spanish. Domesticated chickpeas have been found in the aceramic levels of Jericho (PPNB) along with Çayönü in Turkey and in Neolithic pottery at Hacilar, Turkey. They were found in the late Neolithic (about 3500 BC) at Thessaly, Kastanas, Lerna and Dimini, Greece. In southern France, Mesolithic layers in a cave at L'Abeurador, Hérault, have yielded wild chickpeas carbon dated to 6790±90 BC. Chickpeas are mentioned in Charlemagne's Capitulare de villis (about 800 AD) as cicer italicum, as grown in each imperial demesne. Albertus Magnus mentions red, white, and black varieties. Nicholas Culpeper noted "chick-pease or cicers" are less "windy" than peas and more nourishing. Ancient people also associated chickpeas with Venus because they were said to offer medical uses such as increasing sperm and milk, provoking menstruation and urine, and helping to treat kidney stones. "White cicers" were thought to be especially strong and helpful. In 1793, ground-roast chickpeas were noted by a German writer as a substitute for coffee in Europe. In the First World War, they were grown for this use in some areas of Germany. They are still sometimes brewed instead of coffee. Sequencing of the chickpea genome has been completed for 90 chickpea genotypes, including several wild species. A collaboration of 20 research organizations, led by the International Crops Research Institute for the Semi-Arid Tropics (ICRISAT), sequenced CDC Frontier, a kabuli chickpea variety, and identified more than 28,000 genes and several million genetic markers. The plant grows to 20–50 cm (8–20 in) high and has small, feathery leaves on either side of the stem. Chickpeas are a type of pulse, with one seedpod containing two or three peas. It has white flowers with blue, violet, or pink veins. Several varieties of chickpea are cultivated throughout the world. Desi chana closely resembles both seeds found on archaeological sites and the wild plant ancestor of domesticated chickpeas, Cicer reticulatum, which only grows in southeast Turkey, where chickpeas are believed to have originated. Desi chana has small, darker seeds and a rough coat. They are grown mostly in Pakistan, India and other parts of South Asia, as well as in Ethiopia, Mexico, and Iran. Desi means 'country' or 'native' in Hindustani; its other names include kala chana ("black chickpea" in both Hindi and Urdu) or chholaa boot. Desi chana can be black, green or speckled. This variety is hulled and split to make chana dal. Garbanzo beans or 'kabuli' chana are lighter-coloured, larger, and with a smoother coat, and are mainly grown in the Mediterranean, Southern Europe, Northern Africa, South America, and South Asia. The name means "from Kabul" in Hindi and Urdu, and this variety was thought to come from Kabul, Afghanistan when it was introduced to India in the 18th century. An uncommon black chickpea, ceci neri, is grown only in Apulia, in southeastern Italy. It is around the same size as garbanzo beans, being both larger and darker than the 'desi' variety. Chickpeas are usually rapidly boiled for 10 minutes and then simmered for a longer period. Dried chickpeas need a long cooking time (1–2 hours) but will easily fall apart when cooked longer. If soaked for 12–24 hours before use, cooking time can be shortened by around 30 minutes. Chickpeas can also be pressure cooked or sous vide cooked at 90 °C (194 °F). Mature chickpeas can be cooked and eaten cold in salads, cooked in stews, ground into flour, ground and shaped in balls and fried as falafel, made into a batter and baked to make farinata or cecina, or fried to make panelle. Chickpea flour is known as gram flour or besan in South Asia and used frequently in South Asian cuisine. Chickpeas are popular in the Iberian Peninsula. In Portugal, they are one of the main ingredients in rancho, eaten with pasta and meat, including Portuguese sausages, or with rice. They are used in other hot dishes with bacalhau and in soup. In Spain, they are used cold in tapas and salads, as well as in cocido madrileño. In Italy, chickpeas are eaten with pasta or in soup. In southern Italy, chickpea flour is made into a batter for panelle, a sort of crepe. In Egypt, chickpeas are used as a topping for kushari. Ḥummuṣ is the Arabic word for chickpeas, which are often cooked and ground into a paste and mixed with ṭaḥīna (sesame seed paste), the blend called ḥummuṣ bi ṭaḥīna. Chickpeas are roasted, spiced, and eaten as a snack, such as leblebi. By the end of the 20th century, hummus had become commonplace in American cuisine. By 2010, 5% of Americans consumed hummus on a regular basis, and it was present in 17% of American households. Chickpeas and Bengal grams are used to make curries and are one of the most popular vegetarian foods in South Asia and in diaspora communities of many other countries served with variety of breads or steamed rice. Popular dishes in Indian cuisine are made with chickpea flour, such as Mirchi Bada and mirapakaya bajji. In India, as well as in the Levant, unripe chickpeas are often picked out of the pod and eaten as a raw snack and the leaves are eaten as a leaf vegetable in salads. 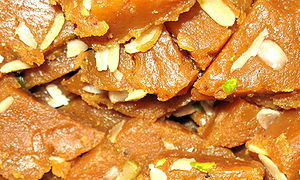 In India, desserts such as besan halwa and sweets such as besan barfi are made. Chickpea flour is used to make "Burmese tofu" which was first known among the Shan people of Burma. 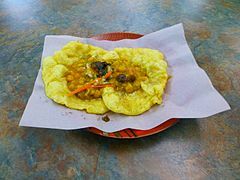 In South Asian cuisine the Chickpea flour (Besan) is used as a batter to coat vegetables before deep frying to make Pakoras. 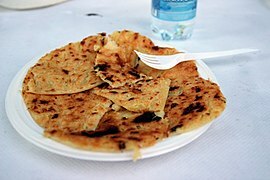 The flour is also used as a batter to coat vegetables and meats before frying, or fried alone such as panelle (little bread), a chickpea fritter from Sicily. Chickpea flour is used to make the Mediterranean flatbread socca and called panisse in Provence, southern France. It is made of cooked chickpea flour, poured into saucers, allowed to set, cut in strips, and fried in olive oil, often eaten during Lent. In Tuscany chickpea flour (farina di ceci) is used to make an oven baked pancake: the flour is mixed with water, oil and salt. Chickpea flour known as Kadlehittu in Kannada is used for making sweet dish Mysorepak. In the Philippines, chickpeas preserved in syrup are eaten as sweets and in desserts such as halo-halo. Jews from Ashkenazi countries traditionally serve whole chickpeas at a Shalom Zachar celebration for baby boys. Guasanas or garbanza is a Mexican chickpea street snack. The beans, while still green, are cooked in water and salt, kept in a steamer to maintain their humidity, and served in a plastic bag. A chickpea-derived liquid (aquafaba) can be used as an egg white replacement to make meringue. Farinata di ceci, a traditional Italian chickpea snack food. Chickpeas serve as an energy and protein source as animal feed. Raw chickpeas have a lower trypsin and chymotrypsin inhibitor content than peas, common beans, and soybeans. This leads to higher nutrition values and fewer digestive problems in nonruminants. Nonruminant diets can be completed with 200 g/kg of raw chickpeas to promote egg production and growth of birds and pigs. Higher amounts can be used when chickpeas are treated with heat. Experiments have shown that ruminants grow equally well and produce an equal amount and quality of milk when soybean or cereal meals are replaced with chickpeas. Pigs show the same performance, but growing pigs experience a negative effect of raw chickpea feed; extruded chickpeas can increase performance even in growing pigs. In poultry diet experiments with untreated chickpeas, only young broilers (starting period) showed worse performance. Fish performed equally well when their soybean or cereal diet was replaced by extruded chickpeas. Chickpea seeds have also been used in rabbit diets. Secondary components of legumes — such as lecithin, polyphenols, oligosaccharides, and amylase, protease, trypsin and chymotrypsin inhibitors — can lead to lower nutrient availability, thus to negative effects in growth and health of animals (especially in nonruminants). Ruminants have generally less problems to digest legumes with secondary components, since they can inactivate them in the rumen liquor. Their diets can be supplemented by 300 g/kg or more raw chickpea seeds. However, protein digestibility and energy availability can be improved through treatments, such as germination, dehulling, and heat. Extrusion is a very good heat technique to destroy secondary components in legumes, since the proteins are irreversibly denatured. Overprocessing may decrease the nutritional value; extrusion leads to losses in minerals and vitamins, while dry heating does not change the chemical composition. Chickpeas are a nutrient-dense food, providing rich content (20% or higher of the Daily Value, DV) of protein, dietary fiber, folate, and certain dietary minerals, such as iron and phosphorus in a 100 gram reference amount (see adjacent nutrition table). Thiamin, vitamin B6, magnesium, and zinc contents are moderate, providing 10–16% of the DV. Compared to reference levels established by the United Nations Food and Agriculture Organization and World Health Organization, proteins in cooked and germinated chickpeas are rich in essential amino acids such as lysine, isoleucine, tryptophan, and total aromatic amino acids. A 100 g serving of cooked chickpeas provides 164 kilocalories (690 kJ). Cooked chickpeas are 60% water, 27% carbohydrates, 9% protein and 3% fat (table). 75% of the fat content is unsaturated fatty acids for which linoleic acid comprises 43% of total fat. Cooking treatments do not lead to variance in total protein and carbohydrate content. Soaking and cooking of dry seeds possibly induces chemical modification of protein-fibre complexes, which leads to an increase in crude fiber content. Thus, cooking can increase protein quality by inactivating or destroying heat-labile antinutritional factors. Cooking also increases protein digestibility, essential amino acid index, and protein efficiency ratio. Although cooking lowers concentrations of amino acids such as tryptophan, lysine, total aromatic, and sulphur-containing amino acids, their contents are still higher than proposed by the FAO/WHO reference. Diffusion of reducing sugars, raffinose, sucrose and others into cooking water reduces or completely removes these components. Cooking also significantly reduces fat and mineral contents. The B vitamins riboflavin, thiamin, niacin, and pyridoxine dissolve into cooking water at differing rates. Germination of chickpeas improves protein digestibility, although at a lower level than cooking. Germination degrades proteins to simple peptides, so improves crude protein, nonprotein nitrogen, and crude fiber content. Germination decreases lysine, tryptophan, sulphur and total aromatic amino acids, but most contents are still higher than proposed by the FAO/WHO reference pattern. Oligosaccharides, such as stachyose and raffinose, are reduced in higher amounts during germination than during cooking. Minerals and B vitamins are retained more effectively during germination than with cooking. Phytic acids are reduced significantly, but trypsin inhibitor, tannin, and saponin reduction is less effective than cooking. Protein digestibility is improved by all treatments of cooking. Essential amino acids are slightly increased by boiling and microwave cooking when compared to autoclaving and germination. Overall, microwave cooking leads to a significantly lower loss of nutrients compared to autoclaving and boiling. Finally, all treatments lead to an improved protein digestibility, protein efficiency ratio, and essential amino acid index. Microwave cooking seems to be an effective method to prepare chickpeas because of its improvement of nutritional values and its lower cooking time. In some parts of the world, young chickpea leaves are consumed as cooked green vegetables. Especially in malnourished populations, it can supplement important dietary nutrients, because regions where chickpeas are consumed have been sometimes found to have populations lacking micronutrients. Chickpea leaves have a significantly higher mineral content than either cabbage leaves or spinach leaves. In natural settings, environmental factors and nutrient availability could influence mineral concentrations. Nevertheless, consumption of chickpea leaves is recommended for areas where chickpeas are produced as food for humans. Preliminary research shows that chickpea consumption may lower blood cholesterol. In 2016, world production of chickpeas was 12.1 million tonnes, led by India alone with 64% of the global total (table). Agricultural yield for chickpea is often based on genetic and phenotypic variability which has recently been influenced by artificial selection. The uptake of micronutrients such as inorganic phosphorus or nitrogen is vital to the plant development of Cicer arietinum, commonly known as the perennial chickpea. Heat cultivation and micronutrient coupling are two relatively unknown methods that are used to increase the yield and size of the chickpea. Recent research has indicated that a combination of heat treatment along with the two vital micronutrients, phosphorus and nitrogen, are the most critical components to increasing the overall yield of Cicer arietinum. Perennial chickpeas are a fundamental source of nutrition in animal feed as they are high sources of energy and protein for livestock. Unlike other food crops, the perennial chickpea shows a remarkable capacity to change its nutritional content in response to heat cultivation. Treating the chickpea with a constant heat source increases its protein content almost threefold. Consequently, the impact of heat cultivation not only affects the protein content of the chickpea itself, but the ecosystem that it supports as well. Increasing the height and size of chickpea plants involves using micronutrient fertilization with varying doses of inorganic phosphorus and nitrogen. The level of phosphorus that a chickpea seed is exposed to during its lifecycle has a positive correlation relative to the height of the plant at full maturity. Increasing the levels of inorganic phosphorus at all doses incrementally increases the height of the chickpea plant. Thus, the seasonal changes in phosphorus soil content as well as periods of drought that are known to be a native characteristic of the dry Middle-Eastern region where the chickpea is most commonly cultivated have a strong effect on the growth of the plant itself. Plant yield is also affected by a combination of phosphorus nutrition and water supply, resulting in a 12% increase in yield of the crop. Nitrogen nutrition is another factor that affects the yield of Cicer arietinum, although the application itself differs from other perennial crops with regards to the levels administered on the plant. High doses of nitrogen inhibit the yield of the chickpea plant. Drought stress is a likely factor that also inhibits the uptake of nitrogen and subsequent fixation in the roots of Cicer arietinum. The growth of the perennial chickpea is dependent on the balance between nitrogen fixation and assimilation that is also characteristic of many other agricultural plant types. The influence of drought stress, sowing date, and mineral nitrogen supply all have an effect on the yield and size of the plant, with trials showing that Cicer arietinum differed from other plant species in its capacity to assimilate mineral nitrogen supply from soil during drought stress. Additional minerals and micronutrients make the absorption process of nitrogen and phosphorus more available. Inorganic phosphate ions are generally attracted towards charged minerals such as iron and aluminium oxides. Additionally, growth and yield are also limited by zinc and boron deficiencies in the soil. Boron-rich soil resulted in an increase of chickpea yield and size, while soil fertilization with zinc seemed to have no apparent effect on the chickpea yield. Pathogens in chickpeas are the main cause for yield loss (up to 90%). One example is the fungus Fusarium oxysporum f.sp. ciceris, present in most of the major pulse crop-growing areas and causing regular yield damages between 10 and 15%. From 1978 until 1995, the worldwide number of pathogens increased from 49 to 172, of which 35 have been recorded in India. These pathogens originate from the groups of bacteria, fungi, viruses, mycoplasma and nematodes and show a high genotypic variation. The most widely distributed pathogens are Ascochyta rabiei (35 countries), Fusarium oxysporum f.sp. ciceris (32 countries) Uromyces ciceris-arietini (25 countries), bean leafroll virus (23 countries), and Macrophomina phaseolina (21 countries). Ascochyta disease emergence is favored by wet weather; spores are carried to new plants by wind and water splash. The stagnation of yield improvement over the last decades is linked to the susceptibility to pathogens. Research for yield improvement, such as an attempt to increase yield from 0.8 to 2.0 tons per hectare by breeding cold-resistant varieties, is always linked with pathogen-resistance breeding as pathogens such as Ascochyta rabiei and F. o. f.sp. ciceris flourish in conditions such as cold temperature. Research started selecting favourable genes for pathogen resistance and other traits through marker-assisted selection. The use of this method is a promising sign for the future to achieve significant yield improvements. ^ "The Plant List: A Working List of All Plant Species". Retrieved 22 October 2014. ^ "Chickpea (Cicer arietinum) - Feedipedia". www.feedipedia.org. Retrieved 26 February 2018. ^ "Cicer arietinum L. - Plants of the World Online - Kew Science". Plants of the World Online. Retrieved 26 February 2018. ^ a b " Baynes, T.S. ; Smith, W.R., eds. (1880). "Gram" . Encyclopædia Britannica. 11 (9th ed.). New York: Charles Scribner's Sons. pp. 36–37. ^ a b c "Cicer arietinum". Germplasm Resources Information Network (GRIN). Agricultural Research Service (ARS), United States Department of Agriculture (USDA). Retrieved 21 October 2014. ^ S, Bell (March 31, 2014). "The small but mighty chickpea". Phys.org. Retrieved 8 October 2015. ^ Advances in Agronomy. Elsevier. 2 April 2001. ISBN 9780080543994. Retrieved 26 February 2018 – via Google Books. ^ a b c "Chickpea production in 2016, Crops/Regions/World list/Production Quantity (pick lists)". UN Food and Agriculture Organization, Corporate Statistical Database (FAOSTAT). 2017. Retrieved 23 February 2018. ^ a b "Chickpea". Online Etymology Dictionary, Douglas Harper. 2018. Retrieved 11 January 2019. ^ "Garbanzo bean". Oxford Reference. 2019. Retrieved 11 January 2019. ^ a b Culpeper, Nicholas. Chick-Pease, or Cicers. The Complete Herbal (1652, originally titled The English Physitian). ^ a b "Introduction: Chickpeas". International Center for Agricultural Research in the Dry Areas. Archived from the original on 18 July 2012. Retrieved 28 August 2008. 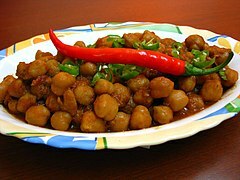 ^ "Chickpea (Chana)". CRN India. Retrieved 8 June 2016. ^ "Global research team decodes genome sequence of 90 chickpea lines". International Crops Research Institute for the Semi-Arid Tropics. 2013. Retrieved 9 October 2015. ^ Varshney, Rajeev K; Song, Chi; Saxena, Rachit K; Azam, Sarwar; Yu, Sheng; Sharpe, Andrew G; Cannon, Steven; Baek, Jongmin; Rosen, Benjamin D (2013-01-27). "Draft genome sequence of chickpea (Cicer arietinum) provides a resource for trait improvement". Nature Biotechnology. 31 (3): 240–246. doi:10.1038/nbt.2491. ISSN 1087-0156. PMID 23354103. ^ "Taxonomy and Nomenclature for Family Leguminosae Juss., Cicer arietinum subsp. arietinum". Mansfeld's World Database of Agricultural and Horticultural Crops. Retrieved 31 January 2008. ^ Ferretti, Elena (April 5, 2010). "There's Hummus Among Us". Fox News. ^ "Order Sweets Online- Delivery all India -Khaochatpata.com". ^ a b c d e f Bampidis, V.A. ; Christodoulou, V. (2011). "Chickpeas (Cicer arietinum L.) in animal nutrition: A review". Animal Feed Science and Technology. 168 (1–2): 1–20. doi:10.1016/j.anifeedsci.2011.04.098. ^ "Nutrition facts for Chickpeas (garbanzo beans, bengal gram), mature seeds, cooked, boiled, without salt, 100 g, USDA Nutrient Database, version SR-21". Conde Nast. 2014. Retrieved 15 January 2015. ^ a b c d e f g El-Adawy, T.A. (2002). "Nutritional composition and antinutritional factors of chickpeas (Cicer arietinum L.) undergoing different cooking methods and germination". Plant Foods for Human Nutrition. 57 (1): 83–97. doi:10.1023/A:1013189620528. PMID 11855623. ^ a b c Ibrikci, H.; Knewtson, S.J.B. ; Grusak, M.A. (2003). "Chickpea leaves as a vegetable green for humans: evaluation of mineral composition". Journal of the Science of Food and Agriculture. 83 (9): 945–950. doi:10.1002/jsfa.1427. ^ Pittaway, JK; Robertson, IK; Ball, MJ (2008). "Chickpeas may influence fatty acid and fiber intake in an ad libitum diet, leading to small improvements in serum lipid profile and glycemic control". Journal of the American Dietetic Association. 108 (6): 1009–13. doi:10.1016/j.jada.2008.03.009. PMID 18502235. ^ Mixed Bean Salad (information and recipe) from The Mayo Clinic Healthy Recipes. Accessed February 2010. ^ a b c Mishra, U.S., Sirothia, P., & Bhadoria, U.S. (2009). Effects of phosphorus nutrition on growth and yield of chickpea (Cicer arietinum) under rain fed conditions. International Journal of Agricultural and Statistical Sciences, 5(1): 85-88. ^ a b Wery, J., Deschamps, M., & Leger-Cresson, N. (1988). Influence of some agroclimatic factors and agronomic practices on nitrogen nutrition of chickpea (Cicer arietinum L.). Developments in Plants and Soil Sciences, 32: 287-301. ^ Hinsinger, P. (2001). Bioavailability of soil inorganic P in the rhizosphere as affected by root-induced chemical changes: A review. Plant and Soil, 237(2): 173-195. ^ Johnson, S.E., Lauren, J.G., Welch, R.M., & Duxbury, J.M. (2005). A comparison of the effects of micronutrient seed priming and soil fertilization on the mineral nutrition of chickpea (Cicer arietinum), lentil (Lens culinaris), rice (Oryza sativa) and wheat (Triticum acstiyum) in Nepal. ^ Datta, J.; Lal, N (2012). "Application of molecular markers for genetic discrimination of fusarium wilt pathogen races affecting chickpea and pigeonpea in major regions of india". European Journal of Agronomy. 58 (1): 55–65. doi:10.1170/T921. ^ Sheila, J.; Sharma, N. (1996). "A World list of Chickpea and Pigeonpea Pathogens". International Crops Research Institute for Semi-Arid Tropics, ICRISAT (5). ^ Pfaff, T; Kahl, G (2003). "Mapping of gene-specific markers on the genetic map of chickpea ("Cicer atietinum"L)". Molecular Genetic Genomics. 269 (2): 243–251. doi:10.1007/s00438-003-0828-0 (inactive 2018-04-01). PMID 12756536. ^ Millan, Teresa; Heather, J.Clarke; Kadambot, H.M.Siddique; et.al (2006). "Chickpea molecular breeding:New tools and concepts". Euphytica. 147 (1–2): 81–103. doi:10.1007/s10681-006-4261-4. Wikimedia Commons has media related to Chickpea. This page was last edited on 12 April 2019, at 23:36 (UTC).